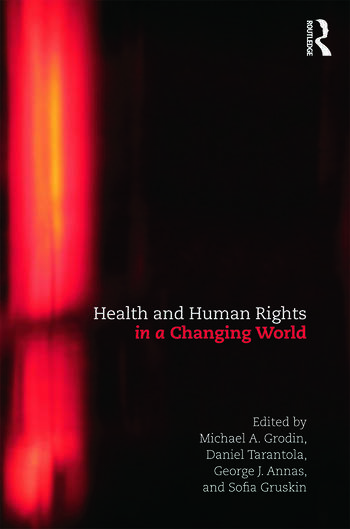 Health and Human Rights in a Changing World is a comprehensive and contemporary collection of readings and original material examining health and human rights from a global perspective. Editors Grodin, Tarantola, Annas, and Gruskin are well-known for their previous two volumes (published by Routledge) on this increasingly important subject to the global community. The editors have contextualized each of the five sections with foundational essays; each reading concludes with discussion topics, questions, and suggested readings. This book also includes Points of View sections—originally written perspectives by important authors in the field. Section I is a Health and Human Rights Overview that lays out the essential knowledge base and provides the foundation for the following sections. Section II brings in notions of concepts, methods, and governance framing the application of health and human rights, in particular the Human Rights-based Approaches to Health. Section III sheds light on issues of heightened vulnerability and special protection, stressing that the health and human rights record of any nation, any community, is determined by what is being done and not done about those who are most in need. Section IV focuses on addressing system failures where health and human rights issues have been documented, recognized, even at times proclaimed as priorities, and yet insufficiently attended to as a result of State denial, unwillingness, or incapacity. Section V examines the relevance of the health and human rights paradigm to a changing world, underscoring contemporary global challenges and responses. Finally, a Concluding Note brings together the key themes of this set of articles and attempts to project a vision of the future. Michael A. Grodin, MD, is Professor of Health Law, Bioethics & Human Rights at the Boston University School of Public Health, Professor of Family Medicine and Psychiatry at the Boston University School of Medicine, and on Faculty of the Graduate School of Arts and Sciences at Boston University. Daniel Tarantola, MD, is a Visiting Professorial Fellow and former Professor of Health and Human Rights at the School of Public Health and Community Medicine, UNSWMedicine, University of New South Wales, Sydney, Australia. George J. Annas, JD, MPH, is William Fairfield Warren Distinguished Professor, Boston University, Chair of the Department of Health Law, Bioethics & Human Rights, Boston University School of Public Health, and Professor, Boston University School of Medicine, and Boston University School of Law. Sofia Gruskin, JD, MIA, is Professor of Preventive Medicine at the University of Southern California Keck School of Medicine and Professor of Preventive Medicine and Law at the University of Southern California Gould School of Law, and Adjunct Professor of Global Health, Harvard School of Public Health.